EN ESCH, Born near Frankfurt / Main, has lived and worked in Hamburg, Chicago, New Orleans, NYC, Los Angeles and currently Berlin. The classically trained percussionist is best known for his distinctive vocals and charismatic stage performances. He is a skilled multi-instrumentalist, programmer and composer and has enjoyed success with KMFDM and the diverse ensemble PIGFACE since the early 90s.End of the 80s, EN ESCH and the electro-industrial outfit KMFDM moved to the US. A tour supporting the band MINISTRY was the starting point for their stunning carreer. Featuring bands like RAMMSTEIN as opening acts, KMFDM pioneered the crossover between techno/dance and heavy metal with their signature industrial sound. EN ESCH composed, recorded and co-produced on the first 10 albums and multiple singles of KMFDM including hits like: More’n’Faster, Godlike and Juke Joint Jezebel. En Esch & KMFDM also appear on various soundtracks of Hollywood movies like: Hideaway, Johnny Memonic, Mortal Combat, Bad Boys etc. He was also core member of PIGFACE in 1990, writing, recording and touring with them until 1993 and again after 2004. He collaborated with Bands like KASTRIERTE PHILOSOPHEN, GIRLS UNDER GLASS, EXCESSIVE FORCE, SISTER MACHINE GUN, CHEM LAB, MORE MACHINE THAN MAN AND EDGE OF DAWN to name a few. After several successful years in the Techno-Industrial scene and countless live performances around the world, the striking front man and talented guitarist now enjoys a cult-hero status in EN ESCHs larger-than-life and commanding stage persona.Today he is also mastermind, singer and frontman of his band “Slick Idiot“ which he founded with guitarist Günter Schulz after the original lineup of KMFDM dissolved in 1999. SLICK IDIOT has released 5 albums. The SLICK IDIOT song "Xcess - Remix by SCHNEIDER of RAMMSTEIN" was featured in in the US-TV series „True Blood“. 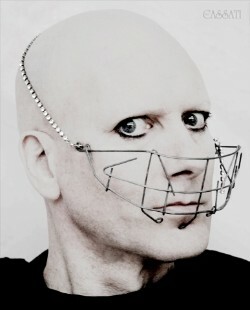 Since 2007 he is collaborating with german vocalist MONA MUR. The duo has released two albums as well as a collaborative album with FM Einheit of Einstürzende Neubauten. 2015 saw the release of EN ESCH’S second solo album “SPÄNK” after a successful crowd funding campaing on PledgeMusic.